After leading his team to a come-from-behind victory to claim his record 5th Super Bowl, Tom Brady attributed a great deal of his longevity to changing his lifestyle and diet. During his MVP speech, he stated that he never thought he’d play this long. He hurt all the time when he was 25, but after changing his diet and lifestyle he’s playing as well as he ever has and feels terrific. This isn’t the first time attention has been directed to Tom’s diet. In fact, people shelled out $200 for a cookbook he ‘wrote’ hoping to attain his skills and model looks by following his diet. The book needs no scientific validation, just look at the before picture. Now, in all seriousness, I do believe his lifestyle is one of the driving factors behind his extraordinary longevity and his diet is a significant part of that lifestyle. But I don’t think it’s the specifics of his diet that drive the nutritional portion of his lifestyle as much as what he’s trying to do. The basic logic behind his diet is simple, manage inflammation. But how do you manage inflammation with your lifestyle? Essentially, managing inflammation with your lifestyle comes down to maintaining good gut health. But what does “maintain good gut health” mean? Furthermore, do we know that the inflammation derived from diet is coming from the gut? If these 2 things are linked, is there any evidence supporting a beneficial performance effect from managing inflammation from your diet. Time to find out. Most people are relatively ignorant about what gut health is and what it can do for them. There’s good reason for this too, most people pay absolutely zero attention to it. Let me give you the crib notes version of what actually matters. When you eat, food enters your mouth, you chew and swallow it, then it hits the stomach. The stomach basically functions as a mixing bowl churning the contents which include the food you just ate as well as stomach acid and some protein degrading enzymes. This messy gloop is called chyme. And now comes the fun part. The stomach empties in to the duodenum, the first part of the small intestine. The pancreas and gallbladder release more digestive enzymes in to the duodenum to break down the chyme.. From here these contents are churned, sloshed and sent along the small intestine to the large intestine, also called the colon. All along the way, nutrients are absorbed as they’re broken down in to units small enough to be absorbed through the wall of the small intestine. Pretty much all of what you ate is gone by the colon; all that’s left is some mucus, fiber and other non-digestable components. These mix with bacteria in your colon and water to form the characteristic turds you see every day. Now that we’ve gone through the crib notes version of the gut, let’s take a look at the part that really matters. To understand where diet-induced inflammation comes from and how to manage it, we have to zoom in to what happens in the small intestine. When digested food particles are anywhere in the small intestine, they’re initially separated from the cells that form the intestinal wall by a layer of mucus. 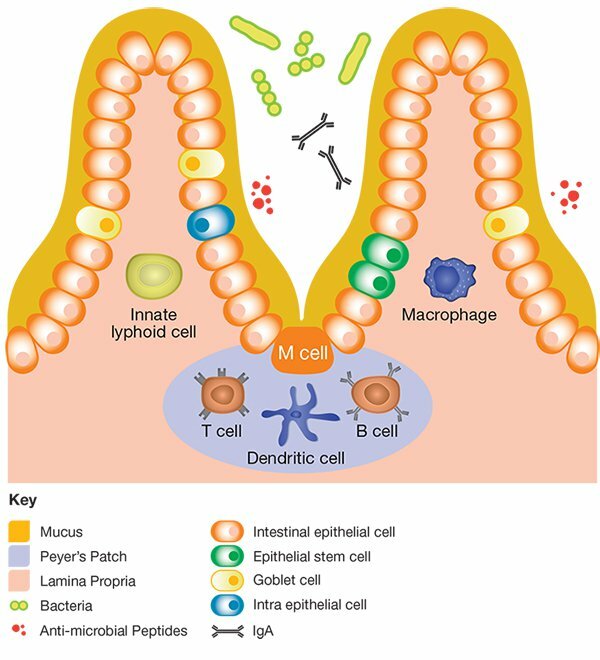 This mucus layer acts as a protective barrier keeping enzymes, large food particles, and bacteria away from these epithelial cells, called enterocytes. The intestinal wall itself is made up of enterocytes that selectively allow nutrients in while keeping unwanted visitors out. These enterocytes are held together by tight junctions that prevent small particles of food and bacteria from slipping in. On the other side of the intestinal wall is an army of immune cells(Dendritic cells, T cells, B cells) just waiting to pounce on anything that comes across. In fact, 80% of your immune system is waiting at the door. These immune cells are able to sense what’s in store for them and coordinate an attack if anything, food particle or bacteria, were to make it across the intestinal wall. 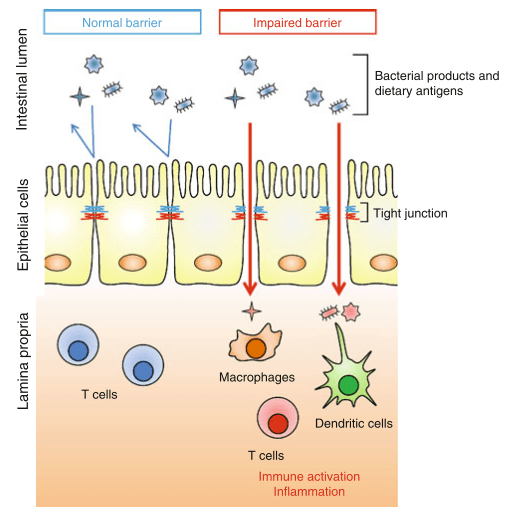 This combination of mucus layer, intestinal barrier, and the immune cells that sense invaders on both sides of the wall form your mucosal defense system. The structure is pretty much analogous to a well-defended city complete with moat(mucus layer), walls(intestinal barrier), and archers(immune cells). Enterocytes are the bricks that make up the wall while the tight junctions are the glue holding the bricks together. Each one of these security measures plays a role in protecting the city from attack. And this city is under constant bombardment. Every time you eat there are a host of factors that can ramp up this mucosal defense system. Ingested bacteria, undigested food particles, and even the digestive enzymes you make to digest your food can damage the wall and cause inflammation. As a result, every time you eat you create some inflammation(1). This isn’t necessarily a bad thing, it just is. At the right level, this inflammation is helpful to you. However, if it becomes uncontrolled it can mess with basically every system in your body. Blood glucose regulation, thyroid signaling, HPA axis signaling, immune system signaling, and more. This is where Tom Brady derives much of the benefit from his diet, he actually pays attention to it. Is food causing this inflammation? It would be wrong to say that this inflammation is specifically due to what you eat. What you eat is certainly part of the equation, but it’s more like the match that starts the fire rather than the actual fire. If you eat something that triggers an initial inflammatory response, this causes the glue that holds the bricks together to fail. The majority of the inflammation doesn’t come until the bacteria bust down the walls and the archers go to town. 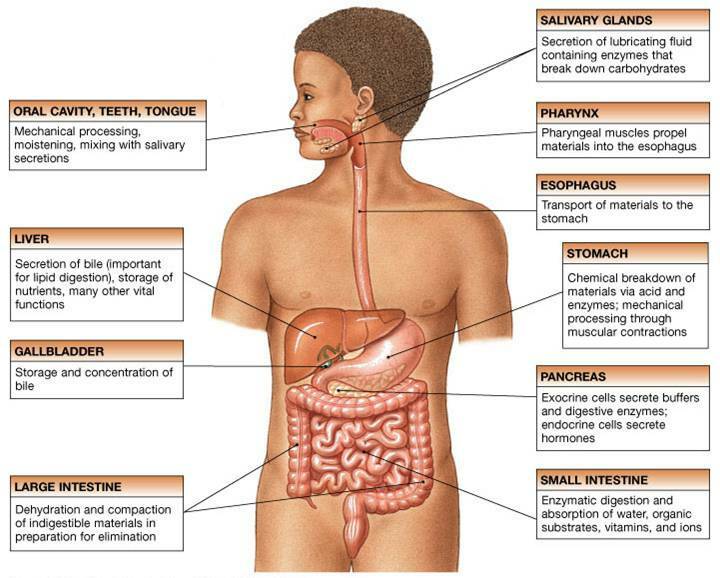 While you ingest a lot of bacteria when you eat, you also have a lot of bacteria living in your intestine. In fact, to be precise, you have 100 trillion bacteria in your intestine. Most of the time these bacteria cause no major issues and your mucosal defense system keeps them far away from the archers waiting on the other side of your intestinal wall. When the mucosal defense system becomes compromised, some of these bacteria can slip through and meet up with the archers. But the archers don’t just go off half-cocked and fire inflammation arrows at everyone, they have to recognize something as a threat first. While there are a number of bacterial components that can alert the archers to a threat, we’re going to focus on something called endotoxin. We’re going to focus on endotoxin because it’s the best studied and most inflammatory component we know. Endotoxin, also called lipopolysaccharide, is a component of the cell wall of gram negative bacteria. There’s a ton of endotoxin in your gut and there are multiple ways that the mucosal defense system neutralizes it before it gets to the intestinal wall. However, all day every day, some gets through no matter how healthy you are or pristine your diet is. In most healthy people the moat, wall, and archers prevent any permanent damage from happening. But some always gets through. Interestingly, people with chronic diseases associated with inflammation such as type 2 diabetes and cardiovascular disease have more. This state, where endotoxin accumulates to a measurable degree in the blood and impacts the way your body functions is called low grade endotoxemia. On the extreme end, if too much endotoxin enters your bloodstream sepsis occurs and your risk for death is substantially elevated. But don’t worry, that’s not going to happen because of your diet. How does food start this process? There are a few proteins that all humans generally can’t break down. Gluten and the dairy protein casein in cow’s milk are 2 such proteins. Humans lack the machinery to effectively break down gluten and the casein found in cow’s milk. But some strains of bacteria found in the gut microbiome can. Since the types of bacteria in our gut are representative of our environmental exposures, there’s a large variability in the human tolerance to gluten and casein. This mechanism is also responsible for a lot of individual food intolerances. Recent research has shown that peanut allergies may be due to a lack of certain bacteria that help us break down the proteins in peanuts. Exposing allergic mice to peanut-digesting strains of bacteria reverses their peanut allergy(2). *Note: When a person is allergic to a food, the food is actually causing the inflammation. Basically, when the undigested protein comes in to contact with the archers they recognize it as a threat and code the protein sequence of that protein in to memory. Anytime you eat that food you fire up the archers. Sometimes, this protein structure is very similar to a protein structure in your body so the immune system attacks that body structure. This process, called molecular mimicry, is thought to be responsible for autoimmune conditions. While this is indeed causing inflammation, there are overt clinical signs of this process. Avoiding foods you are allergic to is obviously necessary, but not something I am covering in this blog. What’s happening in both of these scenarios is that larger proteins are coming in to contact with the intestinal wall and alerting the archers. The archers see them as a threat and begin launching inflammation arrows. Unfortunately, if they light enough fires this can help take down the wall. And when that happens endotoxin enters and wreaks havoc. The Western diet also induces an inflammatory state in the gut and promotes endotoxemia(3). Keep in mind this effect appears to be cumulative. I wouldn’t expect a huge increase in endotoxin from a single meal. But establishing the standard Western diet as your daily diet induces changes in your microbiome that promote a chronic inflammatory state that can increase endotoxin in the blood. In general, the higher fat content in the Western diet promotes an inflammatory microbiome and increases the amount of endotoxin that enters the blood. This causes the glue holding the walls together to erode and allows bacteria to smash down the walls. Another big factor in the Western diet is that it’s low in fiber. Fiber promotes a healthier microbiome that converts fiber in to short chain fatty acids such as butyrate. Butyrate has a number of beneficial effects on health, not the least of which include reducing inflammation and throwing up some new glue to hold the bricks of your wall together. There’s no doubt based on the science that these 2 factors can drive inflammation directly and by altering the microbiome. The question is, for an athlete, what can you expect to see if you start manipulating these factors in your diet. What can an athlete expect when managing diet-induced inflammation? While I think managing diet-induced inflammation is something every athlete should do, what you get out of it isn’t flashy. You’re not going to become Tom Brady because you manage the inflammation in your diet. What you can expect is that if you are Tom Brady, you can be Tom Brady for a lot longer and with fewer missed reps during the season. Coaches are big sticklers for a team performance metric called GLI, or games lost to injury. I would expect an athlete managing diet-induced inflammation to miss fewer games, but more importantly miss fewer reps. You’ll still get injured, you’ll just recover faster. In my opinion, adding reps to the GLI equation is pretty important. There’s no worse interruption to an athlete’s flow than to miss working with teammates on plays and gameplan. There’s almost always a breaking-in period for athletes who have an extended absence due to injury and reducing recovery time is pretty valuable in this regard. Longevity is also important. Of course there are physiological performance variables that decline with age, but experience also makes an athlete great. Prolonging a career by preventing age-related performance decline or the accumulation of damage due to injury can prevent the steep fall off that some athlete experience with age. A less well-studied factor relating to gut health may have huge implications for both longevity in sports and how an athlete ages once they retire. In recent years, a lot of attention has been paid to the cumulative effects of concussions in sports such as football and boxing. Missing in this entire conversation are ways to mitigate this damage. Chronic traumatic encephalopathy(CTE) is a chronic neurodegenerative condition thought to be the consequence of repeated head trauma. Many of the hallmarks of the condition are very similar to other neurodegenerative diseases brought on by age such as Alzheimer’s and Parkinson’s disease. When an athlete experiences a concussion, a couple of things happen. First, we see a weakening of the blood-brain barrier. Think of the blood brain barrier as identical to the intestinal barrier: It keeps things out of the brain that shouldn’t be there. During a traumatic brain injury, the glue that holds the bricks of the blood-brain barrier dissolve and we are left with a defective wall. Within a few hours of this happening, the glue that holds the bricks of the intestinal barrier together also dissolve and endotoxin leaks in to the blood. Typically, endotoxin wouldn’t have access to the brain because the blood-brain barrier would prevent it from gaining access. But since both of these barriers are now weakened, endotoxin can enter the brain and cause problems. When endotoxin is allowed to enter the brain, something interesting happens. Under normal circumstances, cellular guardians of the brain called microglia swoop in and repair damaged tissue. For this process to work smoothly, microglia need to eventually enter a repairative state called neuroplasticity. When microglia are chronically activated by endotoxin, they never enter this state. In fact, they basically begin destroying healthy tissue by creating chronic inflammation because that’s what they’re being signaled to do. This chronic inflammatory state is a hallmark of CTE(4) and one that needs to be halted if total recovery is to be expected. In fact, studies have found that people with CTE have chronic inflammation that persists for 18 years post-head injury(5). Something has to be perpetuating this and diet is an intriguing factor. Basically, something is interfering with resolution of the inflammatory process and endotoxemia is an excellent candidate. In fact, the same chronically activated microglia seen in CTE can be induced in laboratory animals by exposing their brain to endotoxin(4). Alcohol abuse and chronic NSAID use are also both considered contributing factors to CTE and both have deleterious effects on the intestinal and blood brain barriers. In my opinion, the rampant use of NSAIDs in football players likely contributes to the high prevalence of CTE in retirees from the sport. NSAIDs are known to impair mucosal defense by eroding the mucosal layer and impairing multiple other factors(5, 6). Ironically, cannabis is a far better option as it’s been shown to improve intestinal barrier function and decrease inflammation(7, 8). Oddly enough, it can also reverse NSAID induced gut damage(9). 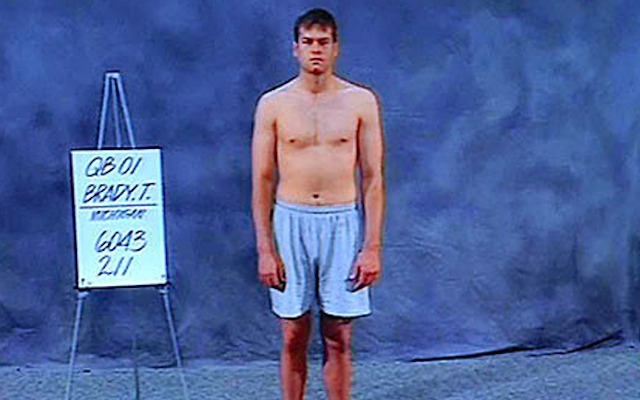 So is the Tom Brady diet the way to go? So back to Tom Brady’s diet. As with any diet, some of the things he does are good while others probably have a negative effect on gut health. Probably the biggest factor going for him isn’t the specifics of his diet so much as the general effect of managing diet-induced inflammation. Nobody else is doing this so he’s way ahead of the curve here. All of these factors will cause a general lowering of inflammation in the gut. Additionally, most of these factors are modulating his microbiome which will provide long-term protection by helping to maintain mucosal defense. Just a note on pesticides and environmental toxins. Many downplay the potential benefit of limiting exposure to environmental toxins but this plays a substantial role in gut health. Environmental toxins such as BPA, PCBs, and glyphosate are continually cycled through the gut with bile and acted on by bacteria as well as cellular detoxification systems there. This has the potential to cause immediate inflammation as well as longer-term microbiome-related inflammation(10). Preservatives and non-caloric sweeteners can also have long-term ramifications for the microbiome with recent research indicating non-calorie sweeteners may promote an inflammatory microbiome(11). What Tom Brady is doing from a diet perspective isn’t all that new. We’ve known for a while that chronic inflammation interferes with a number of processes that are important for human health and performance. We’ve also known that diet type induces inflammation. However, most of the attention in this area has been directed towards improving things like Type 2 diabetes and cardiovascular disease, not promoting optimal athletic performance. Moving forward, there are a number of ways that managing diet-induced inflammation can be applied to sports. What it all comes down to is that too much inflammation will interfere with your ability to recover from practices, games, and injuries. It could also have a deeper impact on sports performance by altering the hormonal response to practice and training. Longevity in sport is important to athletes, particularly as they reach the twilight of their career. Managing diet-induced inflammation won’t help you beat father time, but it will help you hold him off for a bit. More importantly, it could help make your retirement healthy and enjoyable with much less permanent damage. Find this informative and want more? We have something pretty big coming down the pipeline: The Ultimate Guide to Healing your Gut. In this private blog I’ll cover what I consider to be the most important factors in returning your gut to good health. I’ll tell you the factors I try to fix, why I think you need to fix them, and a few ideas on ways to to accomplish fixing them. This one will only be available to members of the private facebook group so request entry here. New study confirms: Supplemental creatine is great for your gut!!! Why physical activity is necessary to beat chronic inflammation.